TAMPA, Fla. — A religious liberties organization has submitted a letter of complaint to a school district in Florida after being contacted by parents who say that their child’s math teacher is promoting homosexual advocacy in the classroom. The teacher denies any wrongdoing. It provided a photograph of one of the crucifix pendants. Meanwhile, according to additional photographs provided to the organization by parents, Reidas has decorated her classroom with various homosexual advocacy material, including buttons on her desk that read “I Love My LGBT Students” and “Safe Schools for All” in promotion of the Gay, Lesbian and Straight Education Network (GLSEN). 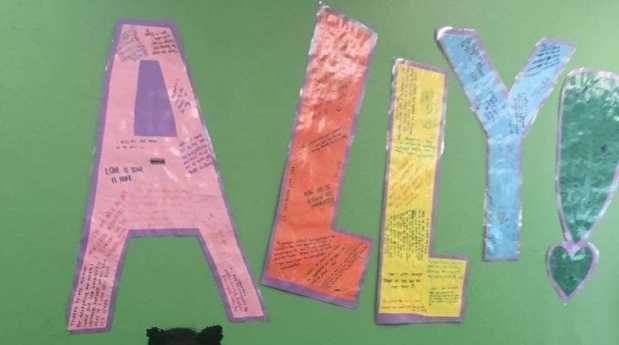 A poster is also displayed on the wall advising that her classroom is “safe and inclusive” for “lesbian, gay, bisexual and transgender students and their allies,” and the word “ally”—also posted to the wall—is spelled out in large cut-out letters and covered with handwritten sayings in support of the homosexual lifestyle. At the time of the correspondence, it was also believed that Reidas planned on promoting the GLSEN’s “Day of Silence” and was apparently tweeting about homosexual advocacy issues during class time. While Reidas serves as the sponsor of the school’s “gay-straight alliance,” Liberty Counsel believes the teacher’s actions violate district policy, which states that staff “may not dedicate work time to an outside interest, activity or association,” since her homosexual advocacy has nothing to do with math class. “Ms. Riedas has … ‘use[d] institutional privileges for personal gain or advantage’ in promoting her own politically activist LGBT viewpoint to the students, which are a captive audience. Her choice of buttons and classroom décor give the overwhelming impression that her lesbian identity is foremost in her mind at all times, and is designed to show students in no uncertain terms how she views the world,” the group wrote. However, Reidas has denied any wrongdoing, stating that she only told one student at the beginning of the year not to wear rosary beads because they could be considered gang symbols as per district policy. She said she would never prohibit students from wearing crosses, claiming that she herself identifies a Christian. “I’m a Christian myself. I would never do that because I would be hurt if someone would tell me not to wear my cross,” Reidas told the Tampa Bay Times. And while she didn’t deny the homosexual advocacy displays in her classroom, she asserted that such discussions are separate from math class and that she’s simply trying to let students know that her room is a safe space from bullying. She said that as word has spread about the controversy, some students are now purposefully coming to class with Roman Catholic rosaries and/or are drawing crosses or writing Scripture on the back of their math papers. Liberty Counsel President Mat Staver disagrees. The district is currently investigating the complaint.